. . . and babies make four. : On the thirteenth day of Christmas . . .
On the thirteenth day of Christmas . . . I want to introduce you to Danielle, the design girl. Danielle makes blogs pretty. She helped me create this blog for our local FCC group. She is very talented and very creative and was absolutely lovely to work with. And she is offering one of you one of her pre-made blog templates. She has Christmas and everyday designs available. You simply pick from her pre-made designs -- I absolutely love, love, love A Little Birdy -- and she installs it for you. A blog makeover is as easy as that! To enter this giveaway, go visit The Design Girl and come back and tell me which pre-made template you'd choose. 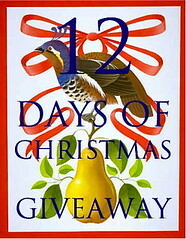 You may enter this giveaway until 12:00 midnight on December 19. Love A Little Birdie. Maybe in green? A little birdie is my favortie too. I liked the fact that she has ideas for every season and holiday. My blog needs help! I didn't know there were people that could help me with my "look". Thanks! To my surprise, I like Girlie Girl best although they are all terrific. I love the "Girly Girl" Design! Oh, I'm in DIRE need of a blog makeover! Her work is so fun! I would choose the Girly Girl template! I love a little birdie too! Danielle has done all of my blogs! It is time for a makeover! I've never had a blog makeover! That would be so cool! I love A Little Birdie, but I might mix up the colors a bit. Love A little birdie and Girly Girl. I too love A Little Birdie. I'm just starting a blog, and this prize would certainly get me off on the right foot!!! I love the "mod bird" design. Thank you!!! I LOVE Girly Girl and A Little Birdy. I have wanted a "new" blog for Marissa and didn't know where to go. These are just beautiful. I'm so excited about this giveaway!!! I think Deck the Blog with Snowflakes is really fun! I love Mod bird and my blog is in much need of a makeover- mine was one of the first generation that Danielle did 3 years ago! I'm loving mod bird- I'm thinking aqua and red...I've admired her work with out knowing it was her's! I frequent quite a few of the blogs she has in her portfolio and have always admired their design! I would love a little birdie too!! I think... Its so hard to decide! I'd choose the "Mod Bird" premade template. Very fun! Thanks so much! too many to choose from, all of them great! I loved the little birdie it is so sweet and would fit me just fine! thanks for sharing I have seen her designs on many blogs. They are lovely. I would have to pick Girlie Girl:) I do love my pinks and greens!! Definitely Mod Bird! Love that one!! Love the Santa, but I have to say if I were to choose one for my blog, I'd say the pink and green version of a little birdy. i would choose MOD-BIRD! i LOVE it! Girlie Girl is awesome. I have my blog started for the girls, just too shy to publish it yet, this would definatly give me the push to. A little birdie is my favorite to. Danielle is very talented and I'm jealous she got to meet Shamu up close! A little birdie is my favorite. I think I'd go with Mod Bird....maybe in red. But A Little Birdie is so cute too! I would love a blog for my daughters daycare. They've been wanting to do that for a while. If I won, we'd put it to use for them. I would love to consider using a new blog design for our local swim club! A fun design is mod bird! I would love to consider a new blog template for our local swim club! I love mod bird! It would have to be A Little Birdy. Sp's Chinese name was "Little Bird". oooooh I like them all, but I guess the Girly Girl has to win this time!